The KeyGrabber MultiLogger is a multiple channel keyboard recorder. It can monitor up to 8 USB or PS/2 keyboard lines and store the recorded data to internal flash memory. Recorded data can be viewed at any time by switching the device to Flash drive mode. 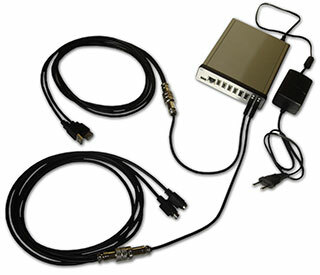 Additionally, recorded data can be streamed in real-time over Ethernet to any chosen IP address. 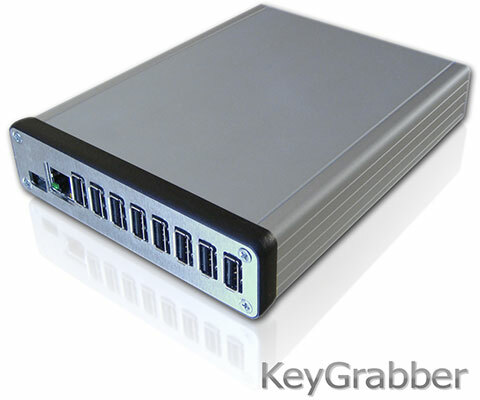 The KeyGrabber MultiLogger does not interfere with keyboard operation, and does not require any drivers or software. Supports national keyboard layouts. Splitter & extension cable for USB keyboards. This cable is recommended in the 8-channel recorder to connect a channel input to a USB keyboard and computer. Each splitter cable requires a splitter adapter. The 4-channel version usually does not require a splitter, as there are 2 USB sockets per channel. A USB-PS/2 converter cable is required for PS/2 keyboards. Splitter & extension cable for PS/2 keyboards. This cable is recommended in the 8-channel recorder to connect a channel input to a PS/2 keyboard and computer. Each splitter cable requires a splitter adapter. The splitter adapter is necessary to connect a splitter cable to a channel input. Want to learn more? Read the KeyGrabber MultiLogger User's Guide or simply ask us.